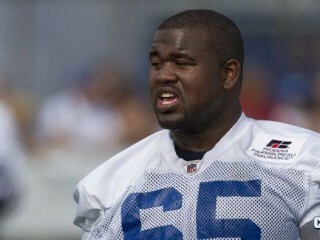 Jacques McClendon is an American football guard for the Indianapolis Colts of the National Football League. 2010: Appeared in four games…was inactive at Houston 9/12, vs. NY Giants 9/19, at Denver 9/26, vs. Kansas City 10/10, at Washington 10/17, vs. Houston 11/1, vs. Dallas 12/5, at Tennessee 12/9 and vs. Jacksonville 12/19…was active but did not play at Jacksonville 10/3…saw first action of NFL career as TE at Philadelphia 11/7. Four-year letterman who started 26 of 49 career games at RG…started 13 games as senior to help team to Chic-fil-A Bowl…started six of 11 games as junior…was Academic All-SEC choice…started six of 13 games as sophomore…was part of line that led NCAA with four sacks allowed on team that made SEC Championship Game…was Academic All-SEC choice…started one of 12 games as freshman…made first career start in Outback Bowl...holds degree in economics and is working towards master's degree in sport management. Full name is Jacques Rashaud McClendon…born in Cleveland, Tenn…attended The Baylor School…was three-year starter on offense and defense…was Parade, EA Sports and Street and Smith All-America choice…was Tennessee Gatorade Player-of-the-Year and Div. II Mr. Football…was two-time all-state and all-region selection…started two years on basketball team and was member of track and field team…set school weightlifting records in bench press and squat…single…resides in Cleveland, Tenn.
View the full website biography of Jacques McClendon.